Quickly pull out the router for hand held use! The 15‑5/8" x 11‑3/4", 5/8" thick tabletop has a MDF core, durable melamine surface, and polyethylene edge banding. The router mounting plate is drilled to accept the Rocky 30 Trim Router with fixed base, or can be drilled to accommodate other brands of trim routers. The table has leveling screws to allow you to adjust the router insert plate flush with the tabletop. The 15‑1/2" wide, one-piece fence stands 2‑7/8" tall. The fence position is adjusted via keyhole slots machined in the tabletop. The fence includes a 2‑1/2" OD dust extraction port and an adjustable height router bit guard to enhance safety. 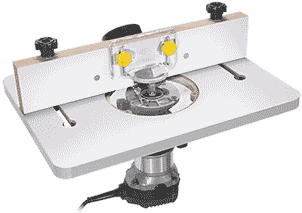 The table can be clamped to your work surface or screwed into position on the work surface using the three countersunk holes near the back edge of the tabletop. SAVE $10! Includes Router Plate, Fence and Dust Port. List $59.95. SAVE $5! Aluminum wall mounting bracket allows you to secure your mini trim router table to a wall. Includes aluminum angle bracket with screws and wingnuts to easily remove the table for storage. Wall mounting holes are spaced 16" on center. Wall mounting hardware not included. List price $24.95. SAVE $5! Includes #9793 and #9795. SAVE $10! 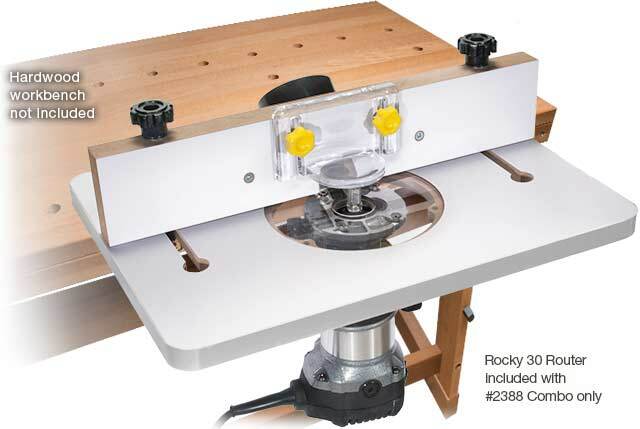 Includes the #9793 Mini Trim Table (with Router Plate, Fence, and Dust Port) and the Rocky 30 Trim Router with fixed base. SAVE $10! List price $124.90.